An un-fussy, handy tool that performs admirably. Comprehensive tool selection. Sturdy build. Good value. If you're anything like us, your gig bag is awash with keys, tuners, Allen keys and just about all other fiddly implements known to man. But hang on a second, those days could be a thing of the past thanks to this handy little device. Basically a Swiss army knife for drummers, the CruzTools Drumtech Drum MultiTool does what it says on the tin. It's a pocket-sized device which contains 14 separate tools. CruzTools claims that each has been included after diligent research into the keys, tuners and attachments that gigging drummers should not be without. The whole thing is housed in a red aluminium body. On getting to grips with the Drum Multitool we see that there are indeed a multitude of arms and prongs folded into one neat little device. We have a whopping nine Allen keys (in both inch and millimetre sizing), a pair of Phillips screwdriver heads, spring height adjustment ruler, a 2.5mm slotted screwdriver and, of course, a standard drum key. "This is certainly something that would come in useful on gig night, especially if you're someone with a few pedals in your kit cupboard"
Down to business, and we start with a nice, easy test - and yup, the drum key is a nice fit for the lugs on each of the two kits and three snares that we have at our disposal. Phew, that could have been embarrassing. The real test comes when we line up such a lengthy row of bass pedals that they almost disappear into the distance. We've got new, old, big name, boutique and the odd piece of junk falling apart at the seams. Surely, we reckon, there must be something that can outfox the MultiTool. After an hour or so of fiddling with our kick pedal nuts and bolts we admit defeat, the MultiTool has won, handling all manner of mechanisms and duties. This is certainly something that would come in useful on gig night, especially if you're someone with a few pedals in your kit cupboard. 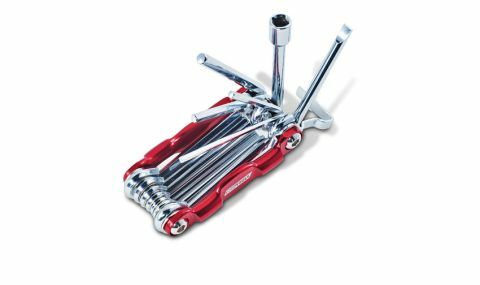 Shelling out £17 for the MultiTool makes more sense than scrabbling around a gig bag and matching the right tool to your chosen pedal, surely. There are, in fact, perhaps more attachments on the MultiTool than we could ever need, but then if our time in the boy scouts taught us anything, it's that there's no shame in being prepared.